The T-Mobile Nokia Lumia 710 has been available for purchase in the United States since January of this year, but if you purchase(d) one between January 11th through March 31, 2012 you get a bonus. 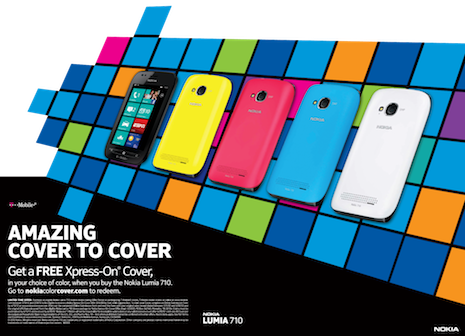 Any T-Mobile Lumia 710 purchased is eligible to receive a free Xpress-On back cover in yellow, fuscia, cyan or white. The choice of color is up to you, and you simply have to fill out some information over at www.nokiacolorcover.com to request your free cover. The T-Mobile Nokia Lumia 710 is available with no annual contract for as low as $349.99 and as low as $39.99 on contract. Allow Nokia 4-6 weeks to send out your cover as soon as they receive your information. This offer only applies to T-Mobile retail or dealer store purchases in the 50 United States, the District of Columbia or Puerto Rico, or online at www.t-mobile.com.